UPDATE 3 May 2017. 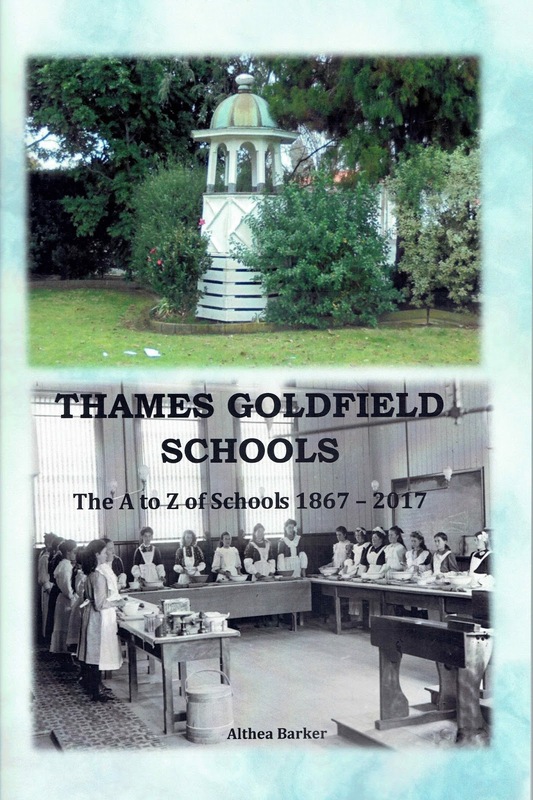 A new booklet "Thames Goldfield Schools" is available. Background: There were many children on the Thames goldfield and education was deemed as an important part of their lives. Initially private Schools provided the only education, then under the Education Act 1877 the present State School System began (free compulsory education). 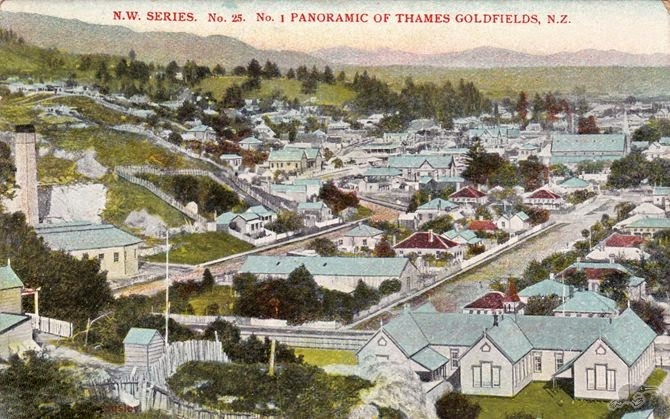 The first on the goldfield was located in a Tent at Shortland, followed by various private locations. The first schools were privately run, but received great patronage from the many children on the goldfields. There were many evening classes that were held. Source: "1873-1973 Thames Borough Centenary" Editor L P O'Neill, "The Cyclopedia of New Zealand"
The following is a list of known Thames Schools, past and present. Addey's School aka Thames Ladies College. 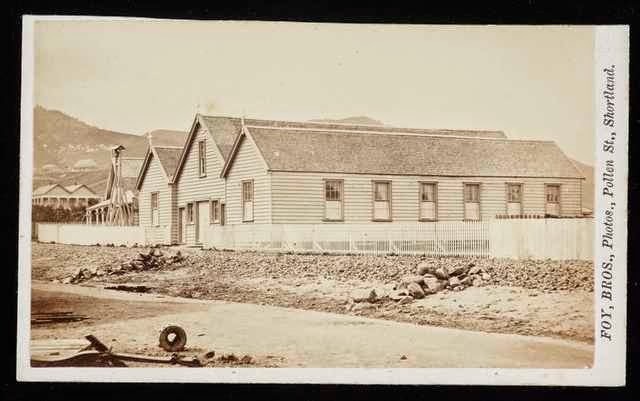 1877 to 1879, Rolleston & Mackay St.
Baillie Street School: See Kauaeranga Boys School. Cary's School. 1870-1878, run by Miss Isabella Cary at Grahamstown and Shortland locations. Central School: See Waiokaraka School. Closed c1971. Davies (Mrs) Preparatory School 1875-1876: Located on the Beach, off Willoughby Street, Shortland. Donovan's (Miss) Ladies Establishment 1871-1875. Run by Miss Mary Jane Donovan at Shortland Town. Eureka School 1870 to 1880: Opened primarily for younger children. Located on Eureka Hill, Mrs McManus was the teacher for six years. Fleetwood’s (Mrs) School c1871 – c1877: Located in Pollen Street, Thames. A seminary for young ladies. Grahamstown School: Early teacher Mrs Skeen. This continued known as Waiotahi School. Harvey's Girls School: Run by James Harvey 1870-c1874. Hauraki School, Shortland c1869 to c1875: early teachers J Fletcher and E C Cornes. One source gives location as present School of Mines site in Cochrane Street. High School c1874 to c1875: Located near the Wesleyan Church in Cochrane Street, run by E C Cornes. Karaka School c1868 to c1878: Run by the Jones family. Located in Mackay Street, in the vicinity of present day Thames Bowling Club. 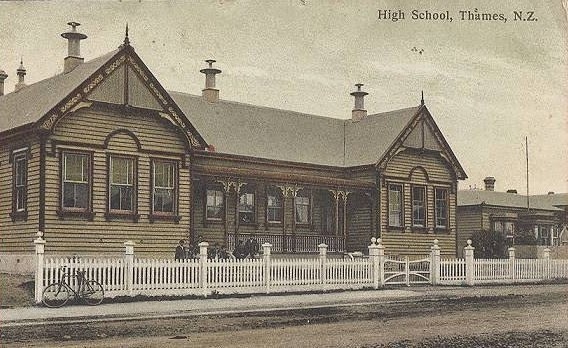 Kauaeranga Boys School c1873 to December 1912: Located on Baillie Street, part of later Thames High School complex. 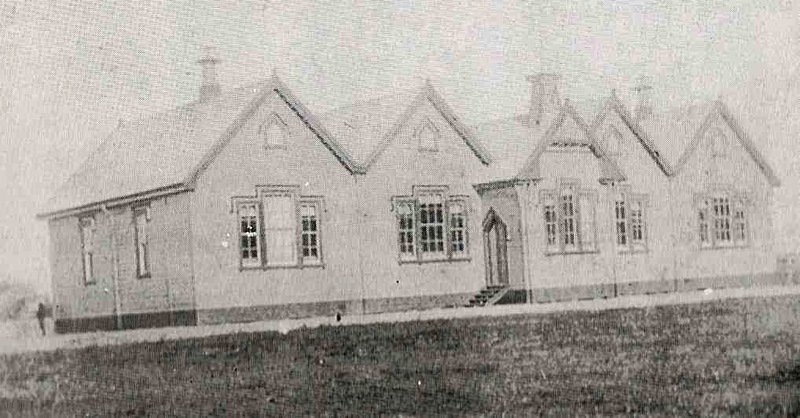 Below: Kauaeranga Boys' Baillie Street School. 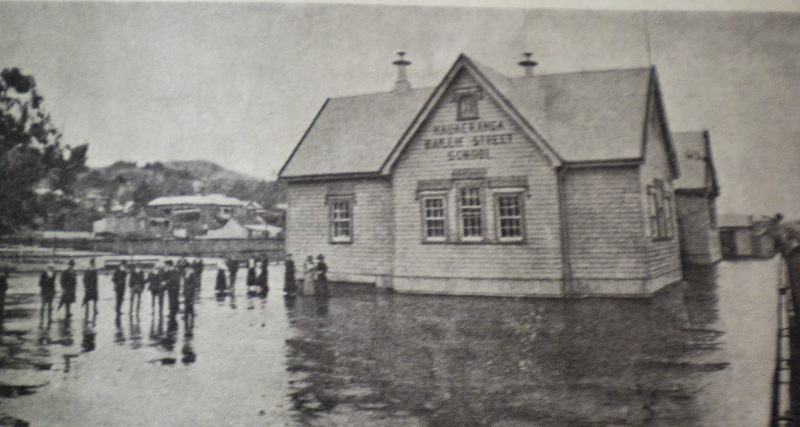 Right: Kauaeranga Girls' Sandes Street School. Kauaeranga Girls School aka Sandes Street School 1870s to December 1902: Located on the corner of Sandes and Richmond Streets. When it closed the building was moved to the present day Thames South School site, where part remains today. Contrary to the name, boys also attended this school. Kauaeranga Valley School c1903 to December 1946: Located up the Kauaeranga Valley. 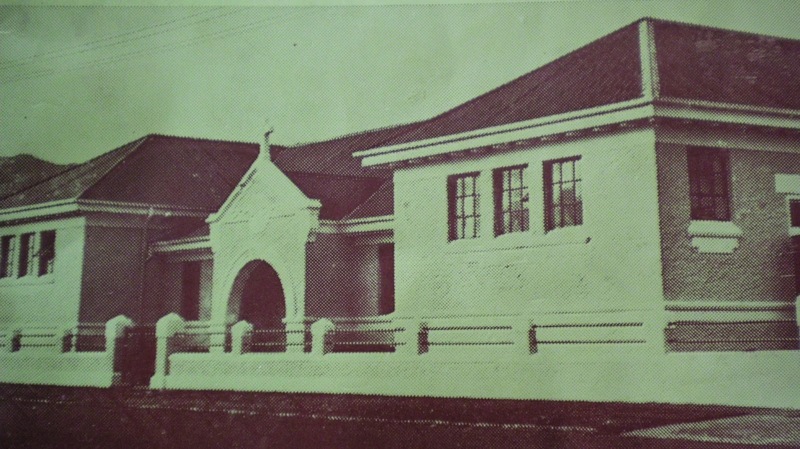 Kirikiri (Kopu) School: c1876 to December 1971. School closed and child went to Moanataiari School and local country schools such as Matatoki. Mrs Maberly’s School c1875-1876: Located in Pollen Street, Thames. Husband was Headmaster at Shellback School. 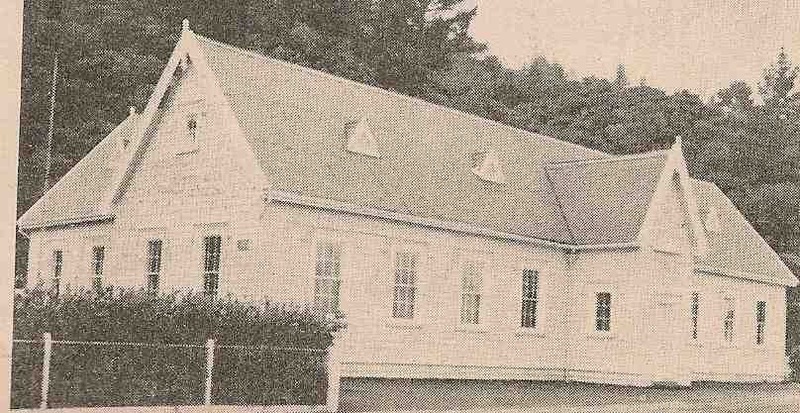 Moanataiari School 1972-current: Located at 101 Kuranui Street, Thames. Created following closure of Thames North, Kopu and Central Schools. Murphy's Hill School c1871 to 1872: Run by Mrs Sinclair. Located in Sealey Street area. O’Reilly’s (Miss) Young Ladies School c1871-1872: Located in the old Bank of New Zealand building, Pollen Street, Shortland. Parawai School (old) 1873 to 1903: Located corner Banks Street & Parawai Road. School closed and pupils went to 'new' Parawai School in Bowen Street (now present day South School). Parawai School (new) then South School 1903 to current: see Thames South School. Parawai School (current) 1967 to current: Located at Lowes Avenue, Parawai, Thames. Phelp’s School c1872 to pre 1874: Located in Mackay Street, may have been taken over by another teacher. Punga Flat School 1870 to December 1881: Located at Punga Flat, in the hills above Thames. Shellback School 1873 to 1877: Predecessor to Tararu School. E C Cornes first Headmaster. Located near the mouth of the Shellback (Pukehinau Creek). Shortland School 1868 – pre 1873: Also known as Mr McKee’s School, located in Richmond Street near the Sandes Street intersect. South School 1903 to current: Opened July 1903 as Parawai New School, in 1915 name changed to Thames South. Located on corner of Grey and Rolleston Streets, Thames. St Francis School (Catholic School) 1900s to current: Located corner Mackay and Willoughby Streets, Thames. Several buildings over the years, with a new building in 1923 and in recent years establishment of a new complex south of old school block. St George’s School (Thames Grammar School) c1871 to c1884: Located in Rolleston Street in old St George’s Church Hall. Headmaster Mr D Schofield. St Joseph's School (Catholic School) 1870s to ? : Located in Willoughby Street, Thames. Name interchanges with St Francis School, unclear when name ceases to be used. St Thomas of Aquinas School (Boys' Catholic School) c1873 to 1913 : Located corner of Queen and Walter Streets, Thames. Tararu School later known as North School 1878 to c1971: Opened 25 January 1878. Building now used as arts and crafts centre at 604 Tararu Road, Thames. Thames High School 1880 to current: Located first in Baillie Street, then Sealey Street, Thames (present day location of school campus). Thames Manual & Technical School: Pre1905 to post 1940. Located at corner of Sealey and Rolleston Streets. 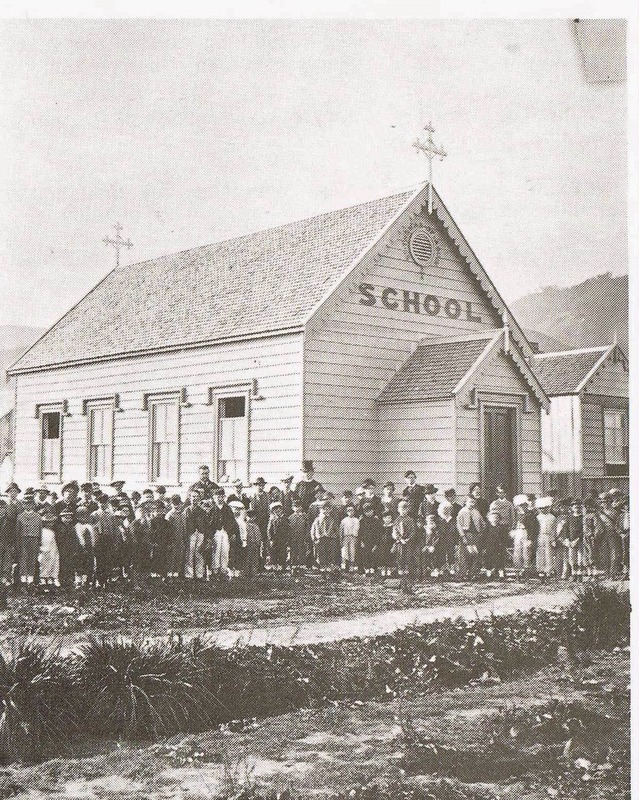 Thames Orphanage and Training School 1879 to 1893: Located up the Kauaeranga Valley. Thames School 1869 to May 1879: Run by C R Robertson. Located in Queen and Cochrane Street area, the predecessor to the Waiokaraka Public School. 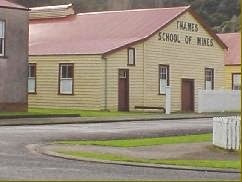 Thames School of Mines 1886 to 1954: Located on Cochrane Street, buildings now part of museum complex. Above: Thames South School (left) and looking down on Waiokaraka School (right). Waiokaraka School later known as Central School 1879 to December 1971: Officially opened on the 15 May 1879 and was called Waiokaraka School. (Sometimes written as Waio-Karaka). Located on Cochrane Street, and to east of Martha Street. Later grounds included land adjacent to Pollen Street. Now the site of retirement village and the Thames Historical Museum. Waiotahi Creek School aka Waiotahi School 1873 to end 1912: Located near the Waiotahi Creek, on the Waiotahi Road - exact location not yet found. Closed end of 1912 and buildings sold 1913. When reviewing the education on offer in early Thames, it is amazing often to see the number of classes offered in areas such as music and other areas such as drawing /art. Classes were at night and on the weekends. Was this for extra enlightenment or designed to fit around the working young teenager or adult? Often extra classes were designed to help with scholarship aspirations designed for those furthering their education and secondary level. Present Day: There is an assortment of pre-school centres in the town. The primary schools are: Moanataiari School, Parawai School , St Francis School and Thames South School (a successor of the original Parawai School). Secondary education provided by Thames High School, which was established in 1880. EARLY CHILDHOOD Centres 2017: Central Kids (308 Grey Street), Matai Whetu TeKohanga Reo (Matai Whetu Marae, Kopu), Pukekos Educare (11 Waipapa Road, Totara), Rainbow Connection (305 Mary Street, Thames), Rose’s Montessori School (Moanataiari Street, Thames), Sealey Street Childcare (109 Sealey Street, Thames), Te Tonga O Hoterini Kohanga Reo (108 Mackay Street, Thames), Thames Early Childhood Education Centre (100 Haven Street, Thames), and Thames-Parawai Playcentre (Parawai Road). More detailed notes on the schools and the early pupils has been given to The Treasury at Thames. They also have collected maps and other details. A CD is available at The Treasury of indexed rolls/class lists and includes known teachers. School lists are available for those indicated at The Treasury (Thames) and Thames Library. Copies of the actual registers are also available to view on request. NZSG Members will also find many of the class lists on the Kiwi Index CD. Some class lists are also available online at Archway. Search Thames School Records available in The Treasury's Index.